On Tuesday, January 14th, HCAF members and staff made a moving presentation to the Florida House Health Care Appropriations Committee, Chaired by Representative Matt Hudson (R-Naples), on the importance of raising reimbursement rates for Medicaid Home Health. Testimony was given by HCAF Board Member Cindy Lavoie, Administrator of Interim HealthCare of Northwest Florida, HCAF staff member Christopher Lipson, Director of Government Affairs and Member Advocacy, and most profoundly by Steve Wilkie, a Medicaid patient of Interim. Mr. Wilkie described the suffering he was exposed to being stuck in the hospital for nine weeks because no home care agency in the entire Florida Panhandle could serve him due to the inability to find available staff members at the current Medicaid rates. Not only was this experience incredibly cruel and damaging, but it was also an outrageous expense for the State’s Medicaid program. What would have cost about $75 per day to treat Mr. Wilkie at home turned into over $1,000 per day for nine weeks in a Tallahassee hospital. As opposed to Medicaid rates for skilled nursing facilities, which are tied to that industry’s costs and rise each year, Florida’s home health rate has not been increased since 1987. Committee members listened intently as Mr. Wilkie described being forced to ask friends, neighbors, and roommates, all without any medical training, to administer IVs due to the fact that Medicaid rarely approves the RN required to perform this service. In closing, Steve Wilkie made a plea to lawmakers to do the job they were elected to do, which includes best serving Florida’s Medicaid population by raising the home health rate. Committee members also heard from Cindy Lavoie about the difficulty of serving Medicaid patients at such paltry rates. Due to additional costs and requirements, Interim has not been able to accept any new Medicaid patients in several years. Like many other Florida agencies, Cindy expressed Interim’s desire to treat Florida’s most neediest patients, but unfortunately the low rates force them to turn these patients away in order to avoid tremendous financial losses. Government Affairs Director Chris Lipson reminded the committee of the incredible rarity it was to be able to bring a Medicaid Home Health patient before them. By definition, these patients are homebound and have difficulty leaving the home. If not for the fact that Mr. Wilkie lives in Tallahassee, providing such testimony from a patient would have been impossible. Chris explained that Mr. Wilkie is a voice for patients all over Florida. In closing, Chris invited representatives to join him on a home care visit to a patient in their own districts. 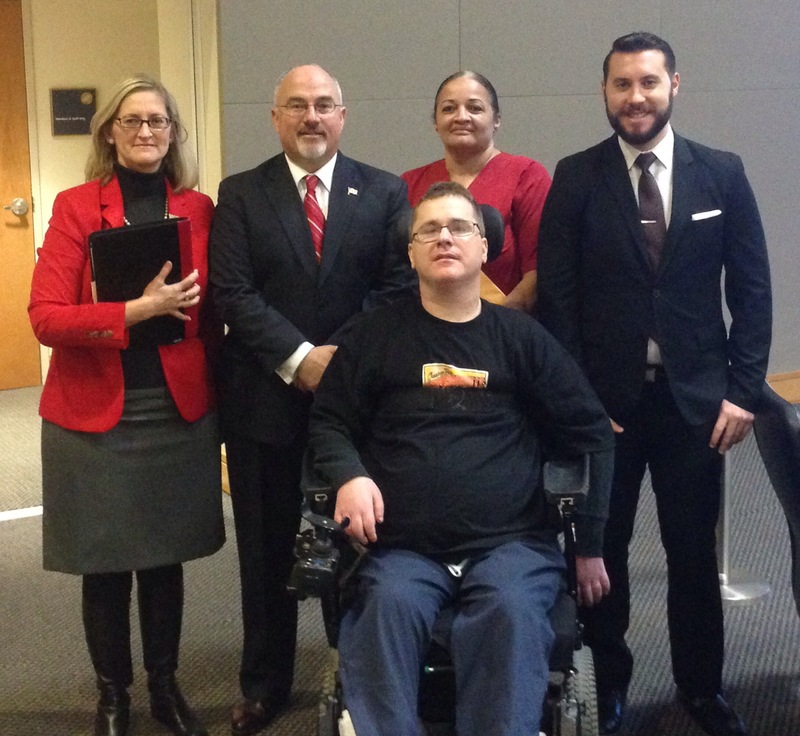 After the meeting, several lawmakers approached Steve to thank him for his attendance and sharing his story with them. Many assured the HCAF group that raising the Medicaid Home Health rate will be priority for them in the 2014 Legislative Session. HCAF is again seeking to increase the rate after having a 10% increase vetoed by Governor Rick Scott in 2013. This entry was posted on January 17, 2014 at 4:22 pm and is filed under Provider Updates. You can follow any responses to this entry through the RSS 2.0 feed. Both comments and pings are currently closed.